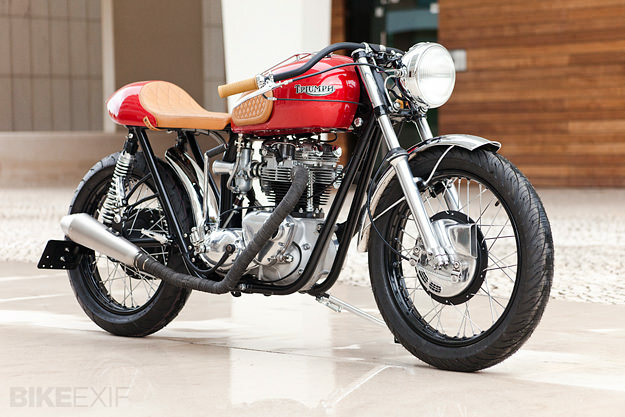 Minimal, elegant and beautifully finished, this is one of the best Triumph cafe racers we’ve seen for a long time. 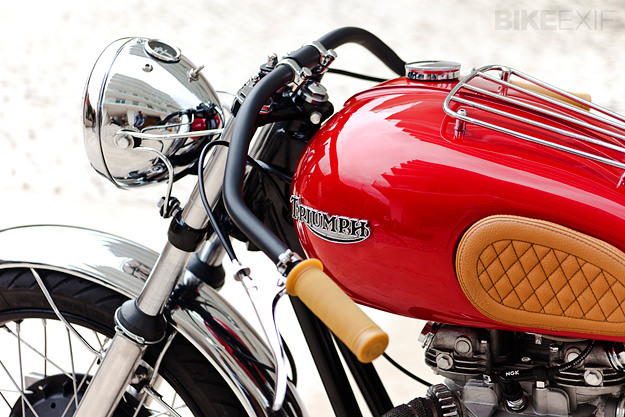 It comes from Tricana Motorcycles, a small workshop in Switzerland that’s building a reputation for classy, slightly off-kilter café racers. Tricana is run by Jonathan Natario, and he’s called his latest creation Briosa, a musical term meaning ‘lively’ in Italian. But when the Triumph TR6R arrived in Jonathan’s Coimbra workshop, it was far from lively—it was a decrepit, incomplete 1972 TR6R that had seen better days. Jonathan spent a lot of time modifying the TR6R’s depleted stock of original parts, but he’s retained the lovely feel of a vintage Triumph. The handlebars are particularly striking, with a wheelbarrow sweep and finished with brown grips matching the intricate leatherwork elsewhere. After taking the 650cc engine apart, Jonathan discovered that it was full of mismatched components—and one side of the crankcase had been machined apart and welded together again. So a complete rebuild was in order, including new pistons, valve guides, valve springs and tappets. Jonathan also installed a modified cylinder head, so he could use two Amal carbs instead of one. The mufflers are from Leo Vince—attached to the original headers—and a Boyer electronic ignition now provides a reliable spark. Much of the beauty is in the detail: both the fuel tank and the Koni shocks have new mounts, to make them lean at slightly racier angles. Jonathan also lowered the front suspension a little to match, and then cut and re-welded the headlight and front fender mounts into a different positions. 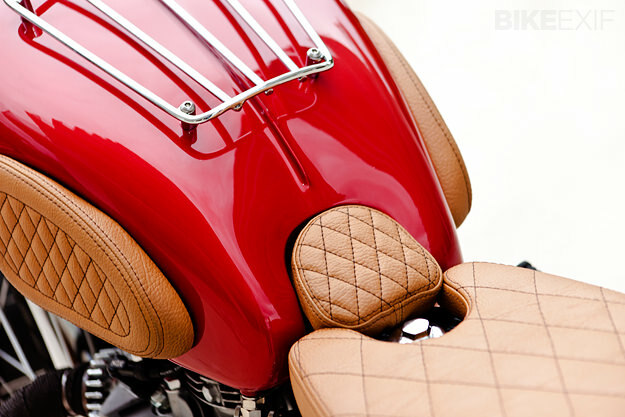 He rebuilt the rear frame to accommodate the beautifully finished custom seat, which sits above a discreet fender, a bobbed and refinished cast-off that Jonathan found in his workshop and modified to fit. Briosa is one bike where you might expect to find Firestone rubber, but Jonathan prefers a more modern look when it comes to tires. “Obviously the Triumph will never lean at the angles these tires are designed for, but it was an aesthetic and personal preference,” he explains. I’d say it was a good call. 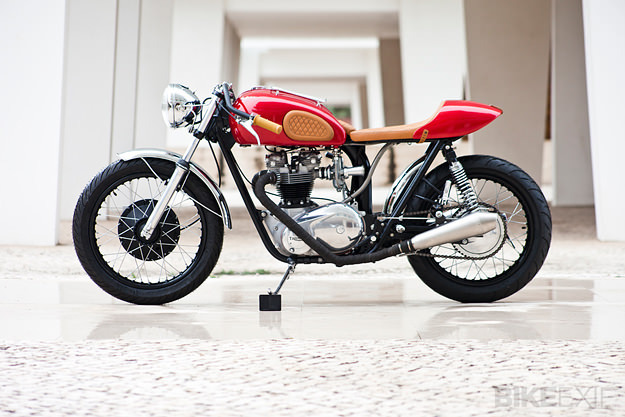 And it’s even better to see a classic TR6R resurrected with such style and craftsmanship. 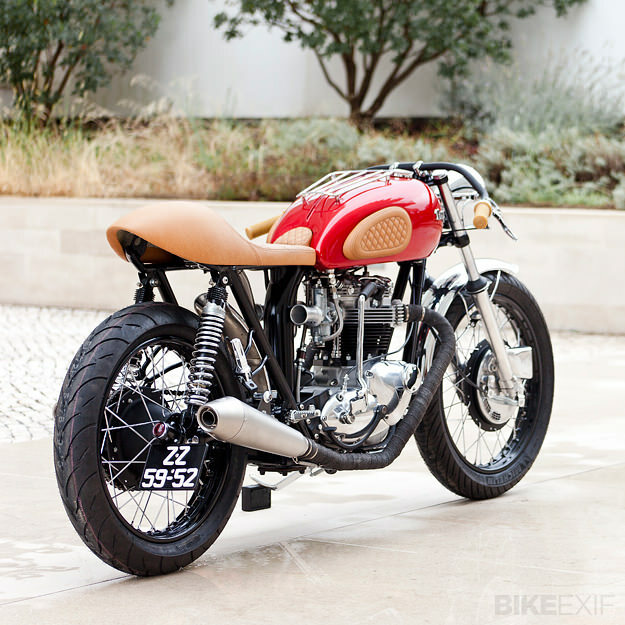 Tricana Motorcycles | Images by Tiago Santiago Silva of Café Racer 351.